Construction on the Los Osos Wastewater Treatment Plant is finally complete, and the spankin’ new sewer is set to go online in March. But residents of Los Osos have some work to do and costs to bear as the county launches into its year-long, three-phase plan to transition the community from polluting septic tanks, to the expensive and long-awaited treatment facility. 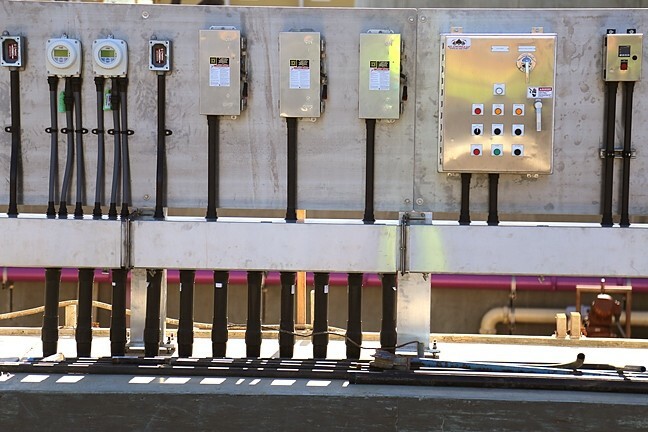 LONG TIME COMING: Los Osos residents will be asked to decommission their septic tanks and make lateral connections to the Los Osos Wastewater Treatment Plant (pictured) over a six-month period. The costs involved are significant—the lateral connection itself will average $3,000 per property. In late March, properties in western and southern Los Osos—from the Sea Pines Golf Course to the Sunny Oaks Mobile Home Park, the area that SLO County has labeled Phase 1—will receive notices in the mail telling them it’s their turn to connect to the sewer’s pipes. Property owners have a cushion of six months to complete the work after receiving the notice. Phase 2 of the transition, which encompasses northern and central Los Osos, is scheduled to start in June; and Phase 3, northeast Los Osos, begins in September. The hookup process starts with hiring a contractor to do the work. John Waddell, project manager at SLO County Public Works, advised residents to obtain multiple quotes from the county’s list of approved contractors to find the most competitive price and the best fit. The price of the work to build a lateral connection to the new sewer system and to decommission existing septic tanks is expected to hover around $3,000 for the average home, but will vary depending on the property and its septic tank configuration, Waddell said. Costs are estimated to range from $2,000 to $10,000. Property owners and their hired contractors need to find a path for the new connection before deciding what to do with the septic tanks. A tank can be decommissioned or repurposed for stormwater infiltration, irrigation, or gray water. Next in the process is obtaining a permit, followed by building the connection and taking care of the septic tank. The lateral connection is just a small slice of the cost Los Osos residents will be paying for the wastewater facility. The service fee per household for the ongoing operation of the plant is about $900 per year, and the annual cost to repay the county for its construction is $710 to $1,088 per year for 30 to 40 years. Those costs will be assessed on property taxes. That assessment translates to monthly costs of roughly $165 for a single-family residence, $120 for a multi-family residence, $55 for a mobile home, and $180 for a nonresidential building. Second District County Supervisor Bruce Gibson told New Times that he’s aware these new costs may be a significant burden for some. And while the U.S. Department of Agriculture (USDA) does offer homeowner loans and grants that could help, not everyone qualifies for them. With that in mind, the county worked in conjunction with local nonprofit Peoples’ Self-Help Housing to prepare a financial assistance program that will help eligible households with the costs. USDA grants of up to $7,500 are available for senior citizens who own their homes but are living at or below 50 percent of the median income level for the area (about $31,000 for a two-person household). Those grants could cover the costs of the lateral connection work. There’s also a USDA loan program available for homeowners of any age who are living at or below 50 percent of the median income. The best loan offered is $20,000 at 1 percent interest paid back over a maximum of 20 years. For residents who don’t meet the requirements for the USDA subsidies, SLO County is setting up its own financial assistance program for property owners living within 50 to 80 percent of the median income range. That program has yet to be approved by the Board of Supervisors, but it plans to offer subsidies of up to $10,000 for the lateral connection work and a “property tax postponement” for low-income senior citizens. Supervisor Gibson also noted that there is “a little bit of flexibility” to decrease the service charges by about $15 per month for low-income individuals. Peoples’ Self-Help Housing is in charge of collecting “income certification applications” from Los Osos residents, which will be counted, sorted, and sent to the county. The county will circle back to residents notifying them of which subsidies they qualify for. Peoples’ Self-Help Housing is still accepting income certification applications from Los Osos property owners, said Sheryl Flores, who works for the nonprofit. For longtime residents of Los Osos like Sue McMillan, a nurse and homeowner, witnessing this decades-long sewer debacle come to an end is both a relief and a hardship. McMillan, who bought her house in 1990, told New Times she “knew this day was coming” and had prepared accordingly. SLO County is holding an informational meeting about the financial programs on March 22 at Los Osos Middle School. Staff Writer Peter Johnson can direct you to sewer-related information online at pjohnson@newtimesslo.com.